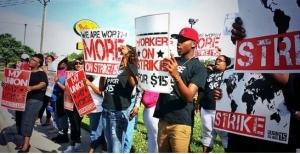 Today fast food workers from around the world—including folks throughout North Carolina – are rallying for a decent raise (most workers In NC make around the minimum wage of $7.25/hour) and the right to collectively bargain. And now that the state legislature has reconvened, a handful of state representatives introduced House Joint Resolution 1068 calling for a raise to the minimum wage today as well. The legislation has been shepherded to the Commerce and Job Development Committee, and we’ll see what happens next. Specifically, let’s see what Rep. Thom Tillis, the speaker of the house and Republican U.S.-Senate candidate, will do about it. But last week on MSNBC he punted –basically to himself — by saying the rate should be set at the state level. MSNBC’s Chuck Todd repeatedly asked him if he as state Speaker of the House would be in favor of raising the minimum wage in North Carolina, and Tillis couldn’t bring himself to answer that question. Tillis probably knows that 73 percent of people believe it’s time to raise the wage. Let’s see what he’ll do about it. My question, since a lot of these unions that fund these “protests” invest a lot of money in businesses, is why doesnt the labor union put their money where their mouth is? They need to invest in fast food restaurants and pay their employees this wage they are asking for. That could get the ball rolling a lot faster if they show that paying that wage is an advantage to staying competitive. Heck, everyone wants their Bib Mac to cost $10. How about a tax cut, that would give all workers a raise? Employers pay for the value added by employees. If your employer won’t pay you what you think you are worth, shop your value around. If no one will pay you more, maybe the employers aren’t the problem.